In 10-inch cast-iron or other ovenproof skillet, heat 1 teaspoon olive oil over medium heat. Add ground beef and onion. Brown all over, breaking up meat as you go. Once meat is browned and onions are soft, add tomato paste and crushed tomatoes. Stir it all up, and then stir in the chili seasoning mix, Worcestershire sauce and pinto beans. Heat to a simmer, and cook about 5 minutes or until sauce has thickened and is bubbling. Remove from heat. Smooth the chili out into an even layer in skillet, and sprinkle with one-third of the Cheddar cheese. Add half of the frozen French fries over top, and then add another one-third of the cheese. Finally add the remaining French fries and the remaining cheese. 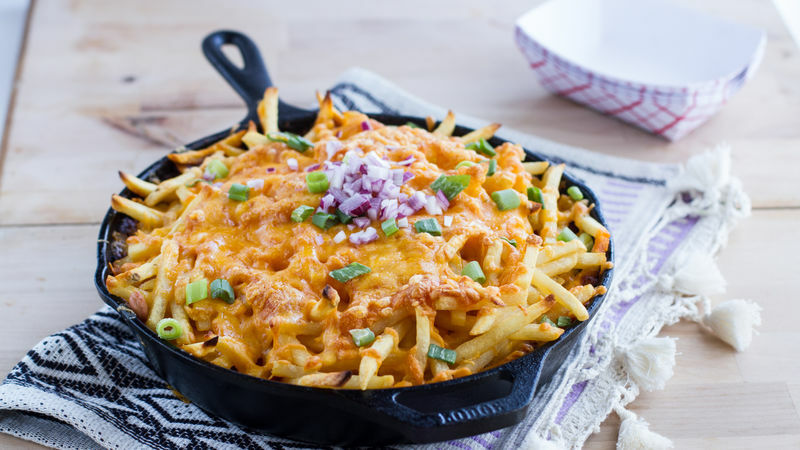 Place skillet in oven, and bake 20 to 25 minutes or until French fries are cooked through and cheese is melted and golden. Remove from oven, and allow to stand 5 minutes. Serve in bowls or plates sprinkled with crumbled bacon and chopped red onion.